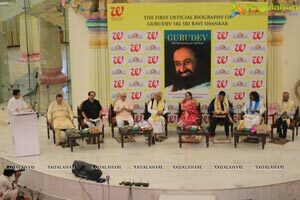 The first-ever official biography of the revered spiritual leader and founder of The Art of Living Gurudev Sri Sri Ravi Shankar was launched today at an impressive event graced by renowned personalities like Justice Venkatachaliah, Ms. Rekha Hebbar, and Mr. Mohandas Pai. 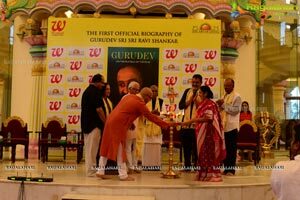 Titled 'Gurudev: On The Plateau Of The Peak, The Life of Gurudev Sri Sri Ravi Shankar' is written by his own sister Bhanumathi Narasimhan. 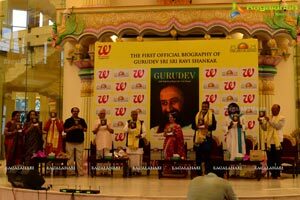 The launch event was attended by thousands of people from around the world and featured a satsang and meditation led by Gurudev. 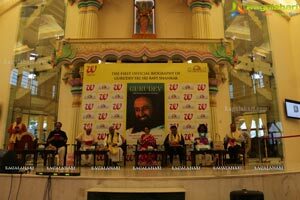 Bhanumathi Narasimhan has been the closest witness to her brother, Gurudev Sri Sri Ravi Shankar’s extraordinary life. Her latest offering is already an Amazon bestseller based on pre-orders. 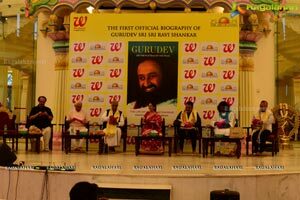 The book promises to be a treat for those who are curious about the relatively unknown years of Gurudev and sheds light on his life from his childhood to growing-up years, when he was an unassuming boy, to a teenager in the company of saints, from a young meditation teacher to a revered spiritual Master. It’s about a life that has brought about a profound and holistic shift in every sphere of human endeavour— from art to architecture, health care to rehabilitation, inner peace to outer dynamism. 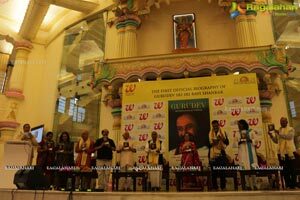 Talking about her association with Gurudev, Bhanu Didi, as she is lovingly called, says she has always followed him, first unknowingly as a child and later with knowledge. "His words and his steps have always guided me,” she says. 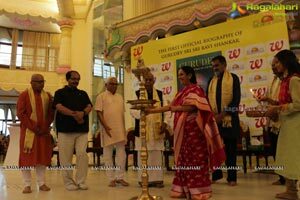 Speaking at the launch of the biography, Bhanumathi, who is also the Chairperson of the International Women’s Conference, said, “India is the land where reverence for the Master is innate. Wanting to know the stories of transformation around a Master is almost natural in our people and this enthusiasm inspired me to pen down these precious memories so that I could share them with everybody." Apart from authoring this book and being the younger sister of Gurudev, Bhanumathi Narasimhan also leads several empowerment projects, including the Art of Living’s school project under which 58904 students get free education in 444 schools in the remotest regions of the country. She also travels across the world teaching meditation to thousands of people from all faiths and nationalities. Gurudev: On The Plateau Of The Peak- The Life Of Sri Sri Ravi Shankar is published by Westland (an Amazon company). “A beautifully written biography of the most celebrated spiritual leader of our times, this book seamlessly weaves heart-warming stories from Gurudev Sri Sri Ravi Shankar’s childhood and growing-up years. His philosophy on God, love and existence along with his sustained peacekeeping endeavours and efforts towards women empowerment and inter-faith harmony, have been beautifully articulated by someone who has seen it all from very close quarters. We are delighted to have the opportunity to partner with the Art of Living to publish this book,” says Debasri Rakshit, managing editor for mind-body-spirit books at Westland. Bhanumathi Narasimhan is the younger sister of Gurudev Sri Sri Ravi Shankar. Innocently at first, and with joyful awareness later, she has followed her brother, her Master, every step of the way. Walking the path, she has witnessed the unfolding of the mystical life of the Master and shares these insightful moments with a wider audience in the book. Inspired by his vision for a stress-free world, she leads the women welfare and child-care initiatives at the Art of Living foundation.